Recipes — Thyme & Co. 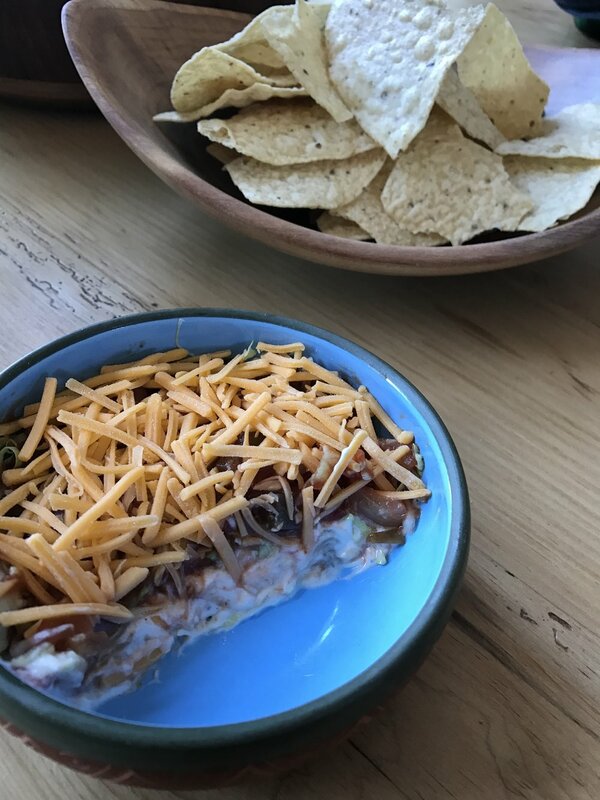 This Taco Dip is different from the rest because of its lighter style. Many taco dips are weighed down with beans that make it very heavy. This recipe is by no means a health dish with is cream cheese and ranch dressing, but the experience is lighter, fresher and down right DELICIOUS!! 1.) In blender of food processor blend the ranch and cream cheese until fully blended. 2.) In a shallow dish use a spatula and spread the cream cheese mixture on the bottom of the dish. 3.) Evenly sprinkle the green onion and tomato over the mixture. 4.) Cover with thinly sliced or shredded iceberg lettuce, it should be completely covering the previous layer. 5.) Add jar of salsa and spread evenly over lettuce. 6.) Top with cheddar cheese. Place in the refrigerator for 1 hour. Serve cool with Tortilla Chips. 1.) Heat a medium sauce pan over high heat. Once pan is hot add oil or spray with canned oil, add onion and kale. Saute until red onion is tender and kale is wilted. Remove from heat, let cool. 2.) In large mixing bowl combine turkey, egg, whole wheat bread, whole grain mustard, parm and s/p and combine well. Add cooled kale mixture and mix. 3.) Separate turkey mixture in to 6 equal patties. Heat saute pan on high, add oil, waiting until pan just starts to smoke and add the patties. Reduce heat to medium/ medium high. Cook 4-5 minutes each side. (the patties should be fairly thin, if yours came out thicker they may require more time. Don't be afraid to cut in to one to check done-ness). 2.) Once the sausage gets slightly browned add, rice tomatoes, water, seasoning, bay leaf and bring to a boil, and then let simmer and stir occasionally. 3.) Let mixture simmer softly until most of the liquid has evaporated. Season with salt and pepper to taste. 4.) Top with a little grated parmesan and/or fresh herbs. I always try to have cooked brown rice in my fridge along with some things that are easy to heat up quickly. Pre chopping ingredients is always a good idea if you know you will use them within a couple days. I also suggest grating your cheeses on a microplane or citrus zester. This will allow for the cheese be sliced thinner giving it a much lighter fluffier texture, and be more easily distributed over the dish. This technique is also good for when you are grating cheese over salads. Throw an over easy egg on top and make breakfast! Add chopped broccoli or leafy greens for some more fiber and nutrients. Combine all ingredients, reserving 2 Tbsp of the Balsamic for later. Marinate for 1 hour minimum or up to 24 hrs. Heat grill pan, cast iron or fry pan capable of going in the oven over medium high heat, spray with desired cooking spray once the pan is hot (I use coconut oil spray) and add chicken. Sear over high heat for 5-7 minutes. Turn to the other side and add remaining 2 Tbsp of Balsamic to the pan. Sear 1 minute over high heat and move pan to the oven, bake for 15-20 minutes. Rest for 10 minutes and serve. This is an easy recipe that you can throw together quickly. I like to make it at the beginning of the week so that I have some ready to throw on salads or sandwiches. When cooking, if you have an instant read thermometer you are looking for the temp to reach 165℉. The more you cook this recipe the easier it will be to judge the amount of cooking time needed. It will vary with the size of the breast you use, and every oven has slight differences so be willing to tweak it as needed. Make sure your pan is very hot before you add the chicken to ensure getting those nice grill marks. And ENJOY! Preheat oven to 400℉. Cut squash in half length wise and brush with 1 Tbsp EVOO. Season with Salt, Pepper, Crushed Red Pepper, Ground Sage. Bake 45min- 1 hour; until squash is tender to the touch and skin can be peeled away. Remove skin and set aside. Heat pot over medium high heat and add 1 Tbsp EVOO, add chopped onions and carrots, gently cook for 6-8 minutes until tender. Season with S/P. Add Squash, sage leaves, curry powder, nutmeg and 4 cups of chicken stock, simmer for 30 minutes. Return to clean pot and season to taste with S/P. Serve! Optional: Garnish with Creme Fraiche and toasted sunflower seeds. 1. Heat non-stick frying pan to medium high, cover with cooking spray and add peppers; cook 2 minutes, add garlic cook another 2 minutes. 2. Add kale to the pan and season with salt and pepper; cook 2 minutes. 3. Pour egg whites over the vegetable mixture, add tomatoes, basil and cheddar, fold over constantly until eggs are fully cooked. 4. Season salt, plate, finish with cracked black pepper. Serve with whole wheat toast. Enjoy! 2. Heat grill or grill pan to SEARING HOT, coat with Canola oil. *If you’re using an outdoor grill you can coat the surface using an old rag or dish towel. 3. Place thighs skin side down, cook 3-5 minutes, checking often, flip over and repeat. 4. If you’re cooking on an outdoor grill move the chicken to the rack and close the top for 10-15 minutes; if using a grill pan on the stove top, put the whole pan in the oven for 15-20 minutes. 5. Check for doneness, let rest for 5-10 minutes and serve with Summer Salad or your favorite accompaniments! 1. Toss all ingredients in a large salad bowl and season with Salt and fresh ground pepper. 2. Use 2-4 TBSP of the pickling liquid over the greens with 2-3 TBSP Olive Oil, toss to mix, adjust to taste. 1. Combine all ingredients in bowl or mason jar. Mix / shake it up and let sit for at least 30 minutes. Barbecued Chicken may seem simple, but often it turns out dry, chars too quickly, skin sticks and pulls off, etc. The truth is that it requires a little finesse and attention to detail. So, I first like to pull the chicken out of the fridge to come to room temperature; this will cut a little off the cook time. Next you want to preheat your grill or grill pan and make sure that it is HOT HOT HOT. If the pan is not up to the proper temperature it will stick to the surface. The last step is to properly grease your cook surface. Many at home cooks forget this step, especially with grilling outside, but it is just as important to lubricate your outdoor grill as it is for a skillet or fry pan. You can use an old rag or paper towel with canola oil to wipe your grill top once it is properly heated. Give the oil a moment to heat up, and then add the chicken. You should hear a satisfying sizzle immediately when you drop it on the grill, if you don’t simply take it off, heat for longer and repeat the process. Once the chicken is on its way you simply want to keep an eye on it. Barbecue sauce has a high sugar content so it will burn and char quicker than with other marinades. Be sure to move the chicken around if it starts to stick, and don’t be afraid to wipe the grill again with some more canola oil. I like to keep a bowl of extra BBQ sauce and brush next to the grill, adding more as the sauce caramelizes. Once you have a nice looking char on the outside of the chickens, move them to the higher grill rack above the heat, close the top and heat til cooked through. You will want to rest the chicken for 10-15 minute, brush once more with the BBQ sauce and you’re ready to go!